Nearly three million people call Chicago home, and it is the third largest city in the United States behind only New York City and Los Angeles. To be expected, this metropolis has just about everything anybody living in or visiting a major city would want. The one thing the Windy City is perhaps not surprisingly lacking is an unobstructed view of the stars and night sky. However, you can leave it to Chicago for even finding a solution to this! Located at the Northeast end of beautiful Northerly Island sits the Adler Planetarium – one of the finest institutions of its kind in the country. 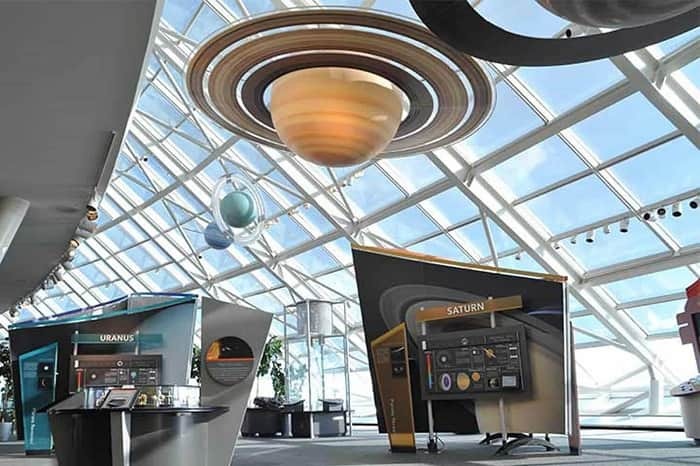 If you are looking to learn about outer space and the universe, admire antique scientific instruments, or have one of the best date nights of all time during your stay with the University of Chicago La Quinta Inn and Suites look no further than a visit to the Adler Planetarium is in order. The Adler Planetarium was established in 1930 in its current location on Northerly Island. Today, this institution shares its space with two other Windy City focal points. Both the Shedd Aquarium and Field Museum are located on Chicago’s Museum Campus – making this one of the most fun and exciting corners of the city. The Adler itself is the oldest planetarium in the Western Hemisphere and was officially declared a National Historic Landmark in 1987, which should be reason enough to visit. Once inside, visitors to the planetarium will be left in awe at all of the exhibits, collections, and shows available for them to explore. Three full-size theatres are always showcasing exciting and educational films about the universe at large, appropriate for the entire family. Exhibitions across the museum highlight the challenges, rewards, and wonders of space science. A collection of antique instruments and old reports will leave museum-goers amazed at how far science has come. Visitors will also encounter the impossible to miss Doane Observatory – one of only a few urban observatories that is also actively conducting research. While the Adler Observatory is an excellent place to visit any time of day and any time of year, it has also been recognized as one of the city’s best date nights. The 21+ “Adler After Dark” events have been rightfully voted both Best Date Night and Best After Hours Event in Chicago. Whether you are looking for a romantic night out or want to explore the universe with family during your stay with us at the University of Chicago La Quinta Inn and Suites, the Adler Planetarium is the place for you. Chicago’s Museum Campus is located a short drive from our front door. Check in with our friendly front desk staff about our free shuttle or for the best way to reach this must-see corner of the Windy City via public transportation.